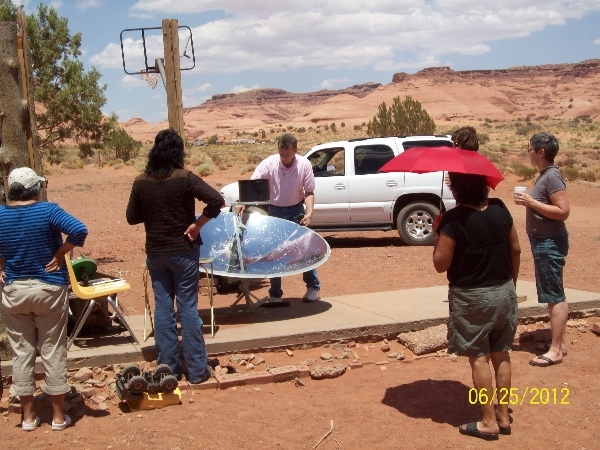 The Navajo Reservation Solar Cooking Project for Summer of 2012 was a great experience that permitted us to help people with a real need for alternative means of cooking their everyday meals. 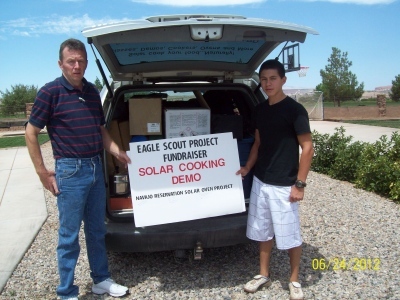 This whole project idea came about in March of this year, 2012, when my Son, Joshua, and I were discussing something we might do for his Eagle Scout Project, something different, as well as beneficial and impactful. 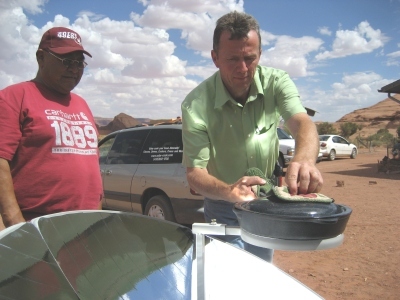 Of course since the both of us have much interest in Solar Cooking, and are daily users of solar cookers, we felt that this would be an area of expertise that we might use to benefit others in a lasting and meaningful way. We thought that it might be nice to be able to help a people who had a real need for alternative forms of cooking that would help them save on the cost of expendable fuels, similar to the same need of people in poor third world countries. We have always been interested in going to a third world country with our solar cookers, in order to be able to help the desperately poor, but it has never really been a feasible possibility for us due to the cost and logistics of doing such a venture. So, for some time we have been looking within our own community and our own country for a similar need and realized there are those right here amongst us who have similar challenges with regards to earning a living and having sufficient food, fuel and sustenance. 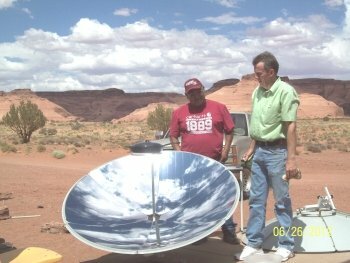 In the past I had worked with an organization based in Park City, Utah called; Adopt-a-Native Elder, and when they contacted me this year about doing a Navajo Reservation solar cooking project with them, I immediately asked them if my son could work his Eagle Scout Project into the program. They said that would be great and asked us if we would raise money for food boxes and extra solar cookers (parabolic) that could be given to the families we would be working with, and so we agreed. 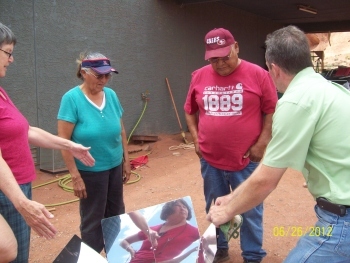 Adopt-A-Native-Elder was receiving funding for this particular phase of the Reservation Project from American Express Inc. which had already designated money for three families, or recipients, to receive two Global Sun Ovens and accessories each, and the food to cook two meals for each family each day. 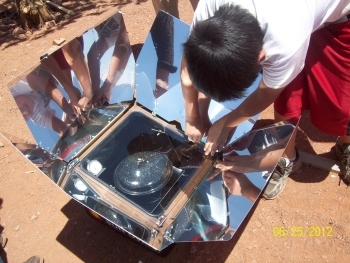 The idea behind this solar cooker project was to educate and teach with hands on experience, the concepts of solar cooking and the ability it provides for the individuals/families to cook without the use of expendable and costly fuels such as wood, propane or charcoal. Our part of the project included setting in motion my son Joshua's Eagle Scout Project by getting the approval of the Eagle Board and then organizing a fund raiser using the scouts within his troop to organize and execute the fundraiser, all within a short period of time before we were scheduled to go to the Monument Valley Navajo Reservation from June 24th through the 28th. 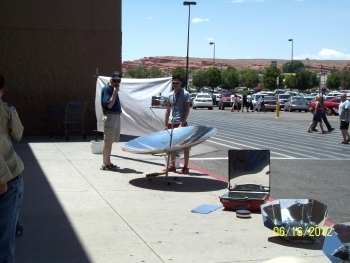 After gaining quick and willing approval from one of the local Walmart, the Fundraiser was held at the local Walmart parking lot in Washington, Utah where we put on a solar cooking demonstration with solar cooked samples and goodies given out to the public while soliciting donations for the Eagle Scout Project. The event ended up being very successful and almost $600.00 was raised in a short time. 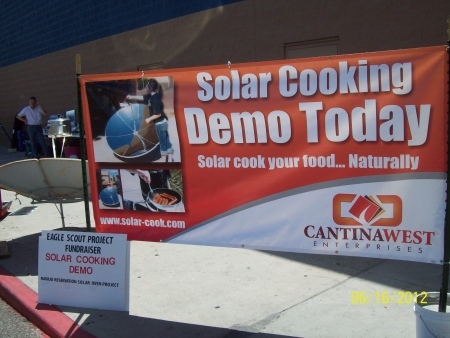 At the same time we had several people donate through our website as well as a handful of donations that were given us by participants in a local golf tournament/charity fundraiser that we were invited to set up our solar cookers at. We were able to raise a total of $850.00 with $270.00 used for the food boxes for each family and the rest to provide four Solar Burner Parabolic Cookers to compliment the six Global Sun Ovens. The original intent was to give two Global Sun Ovens with cookware/accessories to each of the three families along with a parabolic cooker so that they had sufficient capacity to cook several foods/dishes at a time. In the end though we had more, or extra, individuals/families that attended our demonstration/classes while on the reservation necessitating a more even distribution of the solar cookers so that all were provided with a cooker. 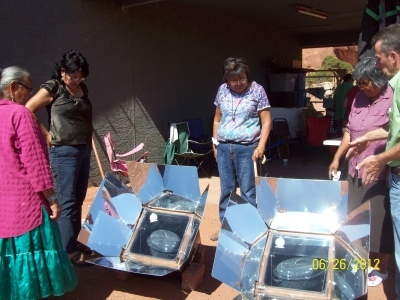 We found that some individuals were fine with having just one solar cooker and others were better off having two, a GSO and a parabolic cooker. 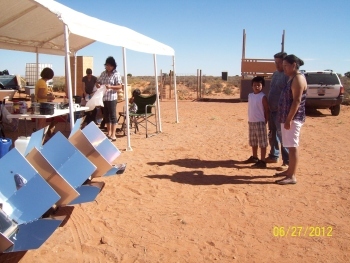 We especially wanted the families/individuals that were most excited and motivated to use the solar cookers to have access to these, because we felt that they would get the most use and benefit from them and would also be a means of sharing the information and lessons they had learned with other family members and friends. 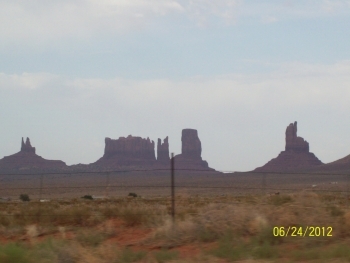 On June 24th we traveled for five hours over to the Monument Valley Navajo Tribal area, taking a southerly route, traveling through Kanab, Utah and Page, Arizona passing through Glen Canyon National Recreation Area (Lake Powell) and through much scenic country along the way. We were in the high desert throughout the trip with nice summer temperatures and spectacular desert vistas all during our time on this project. 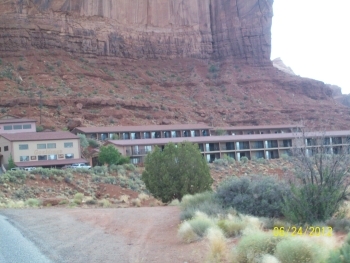 We arrived at our lodging unit in Monument Valley at a famous old trading post and tourist lodging site, Goulding Lodge, which had been established in the 1930's and where many a famous actors, such as John Wayne, Clint Eastwood and others, spent their nights while filming some of Hollywood's classic westerns. Here at Gouldings Lodge we joined up with our associate and program director, Mary Phillips and her friend Dana, of ADOPT-A-NATIVE ELDER, the Park City, Utah based organization that was spearheading the program and which worked for many years giving vital monetary, physical and personal assistance to elderly Navajo Natives throughout the Utah and Arizona Reservation. As soon as we acquired our rooms we loaded all of the clothing, food, and cooker donations into the living room area of the unit in order to sort and take inventory so that we would have all ready for the families each day that we were scheduled to visit and teach each one. We sure had a lot of goods and items that would be distributed over the next few days. Our first day of teaching was on Monday and we were scheduled to work with a family located across dirt roads about 16 miles from where we were staying. Most of the homes are spread out across the reservation with many miles in between each, making for far distant neighbors and infrequent contact with others. When we arrived the family was nowhere to be found and we later learned that they had needed to go and attend to an aged and sick family member for a few days, and so we decided that we would move our schedule up by one day and visit the family/person that we were scheduled to work with the following day. Our guide/interpreter and liaison Bessie Holiday, A Navajo Nation Employee who oversees the senior center for that area, had previously selected and arranged for the families we were to meet with and she made the decision to move the schedule in this manner so that we could take maximum advantage of our time on the reservation. We went back 16 miles towards our lodging and continued past our place on the same road to the west about one mile and were soon at the house of our first recipient, a Navajo Lady by the name of Helen, a sister of Bessie, who looked to be about sixty years old. She greeted us very amicably and introduced us also to her other sister Lucy, who was accompanied by her eleven year old grandson, Justin. After introductions we quickly set up our tables, solar cookers and other wares and began to instruct them on the basics of setting up and using the solar cookers, the two Global Sun Ovens that we had brought for them, as well as the Solar Burner Parabolic Cooker. 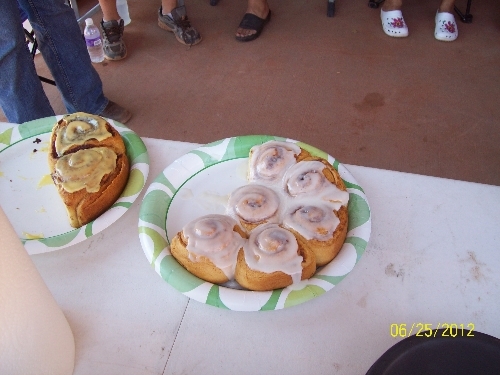 Our menu for that day was to be cinnamon/sweet rolls which we put in right away and hamburgers/hotdogs and corn on the cob along with some hard boiled eggs. First day teaching solar cooking with brand new Sun Ovens. Letting the students learn hands-on. We wanted to show them how the solar cookers could cook a variety of items in various ways and so we felt that hard boiled (baked) eggs both in and out of water would capture their attention among the other things we had planned. We set up the parabolic cooker while the sweet rolls were baking in the two sun ovens and started grilling/frying up burgers and hot dogs, which were cooked within ten minutes from the time we started them in our cast iron frying pan on the Solar Burner. The sweet rolls browned up nicely in abut forty minutes and we let them cool off a bit and then covered them in icing, and before we could even serve the burgers and hot dogs everyone had consumed the majority of the sweet rolls. Before we started eating lunch at 11:30 we had two marinated whole chickens into the Sun Ovens, inside of the round covered roasters where they would cook for the next four and a half hours for our dinner later that evening. We boiled up some eggs on the parabolic cooker and also set a couple of eggs inside of the Sun Oven to bake while we shucked the corn on the cob. We sat around in the shade of the carport and conversed about a variety of topics interspersed continually with instruction on solar cooking and how to most effectively use the solar cookers. We had the participants assist us with the cooking and keeping an eye on the various cookers throughout the remainder of the afternoon, especially when a steady afternoon breeze kicked up and caused us some consternation with continual threats of upended solar cookers. We used bricks to brace the Sun Ovens on each side and back of the cookers and this helped to keep them upright and stable throughout the remainder of the day with no mishaps to speak of. By about 2:30 we had intermittent billowy clouds the rest of the day that came and went; sometimes leaving the cookers in a shadow for as much as five to ten minutes, and then the sunshine would pop back out and raise the temperature of the ovens right back up again. The temperature in each oven hovered between a low of 250 to 350 F during the cooking period. While we were conversing and telling stories amongst the group I broke out the popcorn and we quickly cooked up a big pan of popcorn cooked in olive oil, which was a big hit with our students/participants. Every time we successfully solar cooked the various food items on our menu it was greeted with enthusiasm and amazement at how well all the food turned out by using just the power of the sun to cook it. 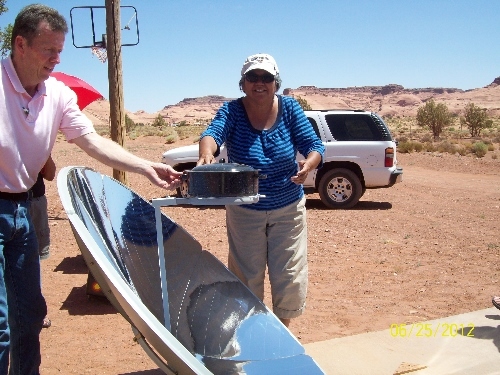 Bessie, our Navajo guide/liaison, had been very skeptical about solar cooking when she first heard about the concept. She had never seen or heard of the such a thing and she had in her mind the idea of food that had been left on a table in the sun, which she had experienced before, stating that "it did not taste very good at all". After she was able to try all of our great solar cooked fare, she became a big advocate of the concept of solar cooking and she took many opportunities over the next few days to help others understand how it worked by way of her own explanation of what solar cooking was. At a half hour before the chicken was finished around 4:30 PM we set the corn-on-the-cob in a big pot of water to cook on the Solar Burner Parabolic Cooker, which took about thirty minutes from start to finish. Once we had everything else ready for the meal we pulled the pots with the chickens out of the Sun Ovens a little after five o'clock and to everyone's amazement the chickens were nice and browned on top and soft and moist inside, to the point that the bones pulled right out of the meat. Our menu and results that day were very satisfactory, and the recipients were very content with the food we ate, and they were quite impressed with the abilities of each of the solar cookers used to cook our meals. 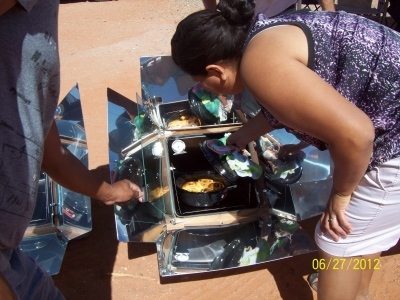 This was the whole purpose of our project on the Navajo Reservation, which was to give the people some hands on experience and various opportunities to cook an assortment of foods on different solar cookers under varying conditions. After we finished cleaning up it was decided we would return to this same home, that of Helen, and we would cook another meal for her and other invited guests, anyone who would like to come and learn about solar cooking. Back at our hotel room we analyzed the results of the day and all of us felt that it had gone very well and that the recipients had learned much, and so we were excited for the next day's opportunity to cook and instruct. The second day of our project produced very similar and satisfactory results with our solar cooking as well, even though we had to battle stronger winds and more intermittent cloudiness through out the day. Nevertheless we had enough sunshine and were able to cook all of our food without any serious mishaps other than micro bursts of wind that really shook and moved the solar cookers. Today though we did a mutton stew with potatoes, onions, carrots and green beans on the side for our dinner. This second day also allowed us to present our solar cookers and instruction to a new couple by the name of Herman and Jenene, both of whom looked to be in their mid to late fifties and who showed much interest and excitement for the opportunity to be able to acquire a solar oven and a solar parabolic cooker for their own use. This couple were very entrepreneurial minded small business owners and made their living principally selling homemade foods at various places on the reservation. 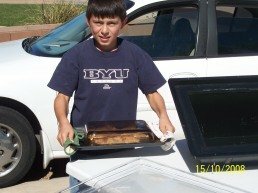 They cooked and sold fresh burritos from their little stand, and they were already imagining how they could use the solar cookers to be able to cook the same, as well as offer fry bread cooked on the Solar Parabolic. All of the previous day's participants were at Helen's house again and so they got a double dose of instruction, which we felt was good because they would be able to become more familiar and comfortable with the concept of solar cooking. After lunch we again sat around conversing and eating more solar cooked popcorn, which is always a favorite with everyone. 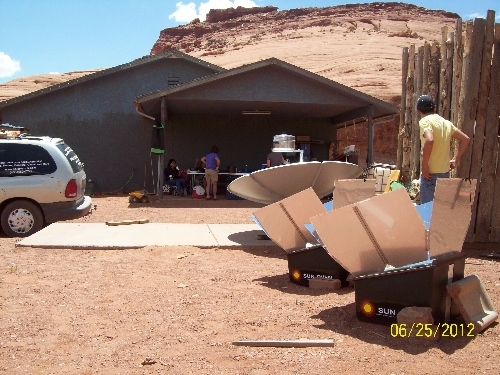 Our third day of the solar cooker project was spent out at a home near a couple of the Famous Monument Valley Landmarks that appear in most of the photos that one would see in tourism brochures, they are called the west mitten and east mitten. This was the home of Bessie's Daughter, Ophelia and Son-in-law, Carlton and their small children, along with two other couples and Carlton's Mother. This day we decided to cook everything we had left, including blueberry quick bread, more sweet rolls, hard boiled eggs, green beans and the last four whole chickens for dinner. Our lunch consisted of the same as before, Burgers, Hotdogs and sweet rolls except that we cooked for quite a few more people this day. The baked goods were finished before lunch was even begun, and so we quickly put the chickens and the green beans into the already preheated Sun Ovens, of which we now had four functioning units available, so that we could assure that we would have sufficient time to cook everything well. After all was set and cooking, we again made solar cooked popcorn and conversed for a while, and then were invited to take a little tour about a mile away to see some hieroglyphs which occupied about an hour of our time. Carlton kept an eye on the solar ovens while we were gone and did a good job of focusing them based on the instruction they had receive earlier that morning. As the day progressed, we could see the clouds again accumulating on the horizon and we knew that by late afternoon we would have some challenges with our solar cooking. Luckily though the clouds did not rapidly gather over where we were and it was about 5:00 PM before they thickened enough to block the sunlight. By 5:00 PM though we had already started to eat and so we were not affected by their presence. 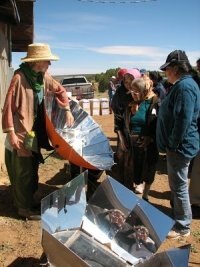 Another couple attended this day, and the husband whose name was Roger, was very open to, and intrigued by, the concept of solar cooking. Roger was very mechanically inclined, like Herman, and he was so excited to find out that he was going to be a recipient of a Solar Burner Parabolic cooker as well as a Sun Oven. He grabbed his power tools out of his truck in order to help my boy, Josh, to put the parabolic together, which they did in very short order. Roger spent quite a bit of time conversing with me as I cooked on the parabolic and gave him instruction on how to use it most effectively. He already understood the theories and concepts behind solar concentration and so it was not too difficult for him to grasp any of what I was teaching; and he had a mechanically oriented mind as well. 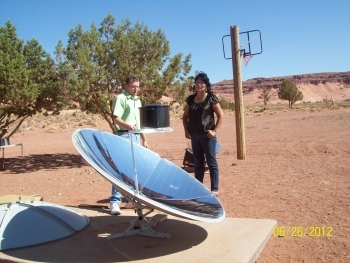 Roger had to leave for work just after our sweet rool, burger and hot dog lunch so he did not get to have dinner with us, but he was happy to leave with his parabolic cooker and his wife would then bring home their Global Sun Oven after the chickens were cooked. There was another couple that also attended, who were not able to receive a solar cooker at the time because we had run out of solar cookers by then. We had planned and budgeted for six Sun Ovens and three parabolic cookers (I brought a fourth, just in case, which went to Roger) and in the end we had to divide the cookers amongst more people. So, rather than each family receiving two Sun Ovens, each ended up with one and certain families or individuals received the parabolic cookers; those who seemed most comfortable with and inclined to use them. ---sidebar--- We are looking into raising more funds to send more solar ovens down at a future date for those who could not receive them at this time. At the end of the day when we returned to our hotel room we were worn out, but very happy and content with the results of our day and with how all had transpired over the last few days. All of us, including the recipients, felt that all of our efforts had been very successful and very well received. There is so much more I could share about this trip and project, but I dare not write any more because I would end up with a small novel that would take up many pages of our site and too much of my time and your time as well. 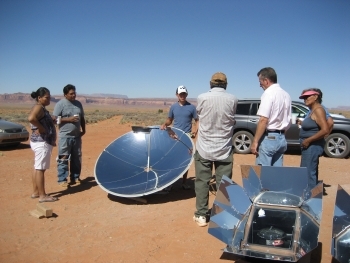 We do plan on keeping our site visitors appraised of our work on the reservation and the progress of those who are now using the solar cookers, so stay tuned for upcoming narratives and short stories. 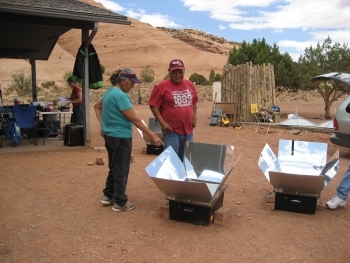 We just heard from Mary Phillips of Adopt-a-Native-Elder that the solar cookers are still being used by most of the recipients, if not all, and the are getting quite a bit of use from the. 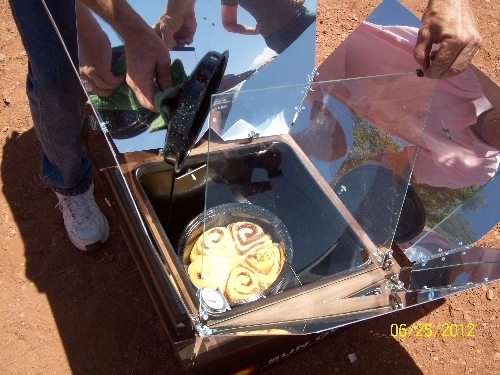 We would like to know all about your Solar Cooking Experiences; successes and failures as well as the cookers you use, whether homemade or manufactured. Share as much detail as you would like...even submit photos as well. *Note: The maximum size for photos is 800x600 pixels. You will need to resize any photo larger than 800x600 pixels using your graphics software or a Web-based resizer, such as Google's Picasa for PC users or iPhoto's Export function on a Mac. 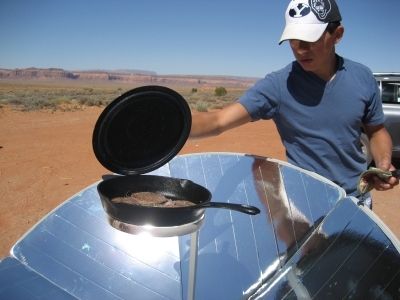 Find out more about how, where and when to solar cook.